There’s no denying that fall is right around the corner (our backs are completely tore up from hauling thousands of pounds of winter squash from the upper field down to the barn!) However, the summer bounty continues to flourish and this late summer pasta is absolutely perfect. The eggplant and cherry tomatoes are braised in a little olive oil and white wine until completely tender. The veggies are then tossed into hot pasta with a healthy drizzle of lemon tahini sauce and topped with plenty of minced parsley and toasted almonds. Serve with a glass of white wine (you’ll have leftovers from the bottle you opened to braise the veggies!) for a lovely summer meal. Prepare the sauce by whisking together all the ingredients until smooth and creamy. This works great with an immersion blender or small food processor for the smoothest consistency. Taste test and adjust seasonings as needed. If the sauce seems to thick, add a touch more water. Bring a large pot of lightly salted water to a boil. Add the pasta and cook until al dente. Drain, reserving 1/2 cup of pasta water and set aside. Meanwhile heat the oil in a large skillet over medium-high heat. Add the eggplant slices and pinch of salt. Cook, stirring occasionally, until golden brown. Add the garlic, cherry tomatoes and wine. Bring the mixture to a boil, reduce heat to low and simmer until most of the liquid has evaporated and the tomatoes have split open. About 5-8 minutes. 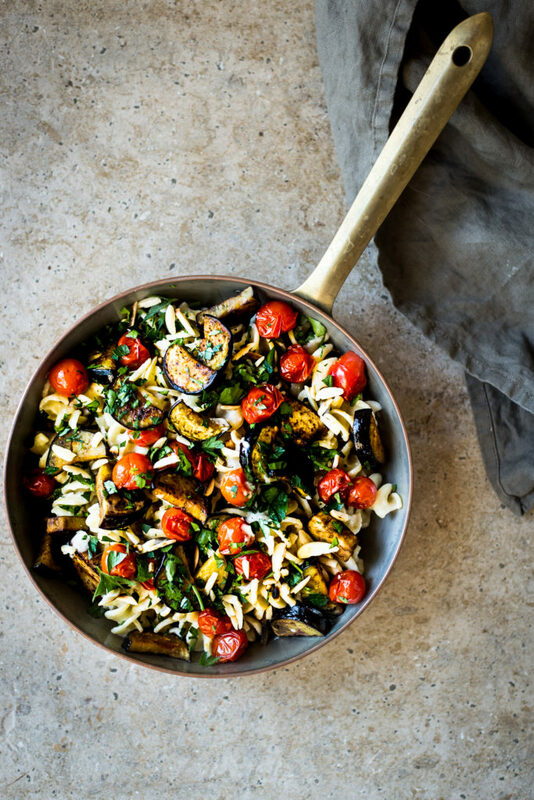 Spoon the veggies over the cooked pasta and drizzle with the tahini sauce. If the pasta seems a bit dry add the reserved cooking liquid. Serve the pasta with the minced cilantro, toasted almonds and salt and pepper to taste.